Ahoy, me hearties! I hope ye be enjoying yer week of drinking, plundering, and painting ye nails! Arr, the week be passing fast, and I be eager to share with ye some treasure! Weight anchor and hoist the mizzen! 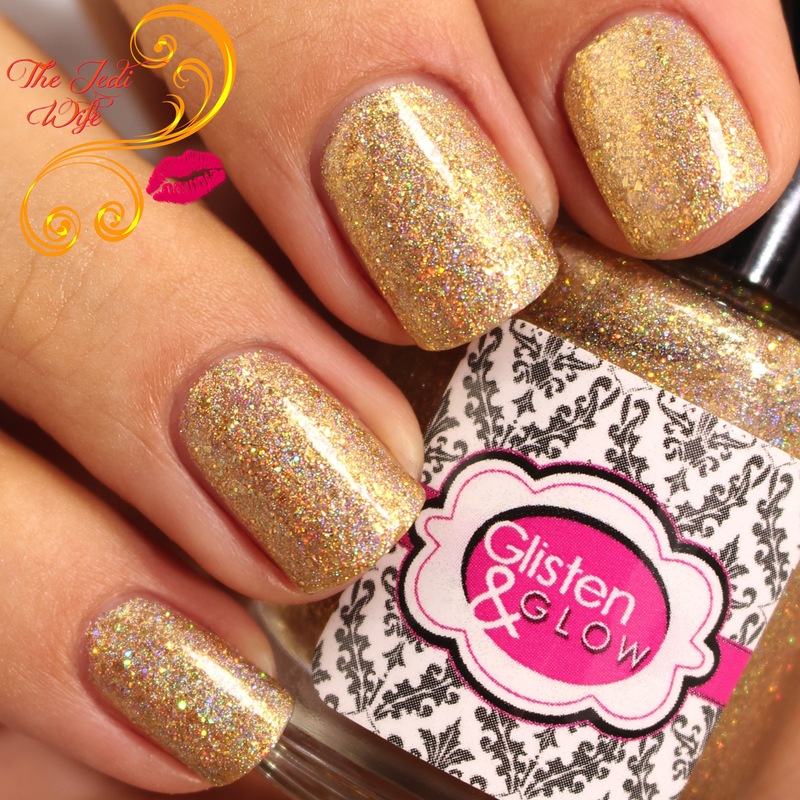 Glisten & Glow has put together a fabulous pirate-themed collection launching later this week, and I am delighted to have the collection to share with you today! I have loved the romanticized version of pirates for as long as I can remember. I *might* have squealed with excitement upon the Pirate's Booty collection reveal at the Cocktails & Colors event in Las Vegas last month. The colors are incredible; let's dive it and check them out! Avast! Ye've been caught by the pirate crew of captain Bartholomew! Best call out "Parlay!" to speak with the captain and settle yer squabble lest ye be forced to walk the plank! Boasting a warm amaranth pink base, Parrot's Parlay is accentuated with hot pink and purple sparks and a dusting of gold shimmer. Parrot's Parlay is the perfect end of season colour to start the transition of summer into fall. There is still the brightness you're longing for on your nails while your toes make their final dip in the pool, but it's not too bright that it feels out of place as the days get shorter and cooler. The formula was spectacular and applied easily with two coats for opacity. Move smartly, you filthy bilge rats, thar be treasure ahead! Aye Spy Doubloons is all about the gleaming bounty from the elemental gold base, the gold and copper holo galaxy microglitters, gold shimmer, and larger gold flakes. One of the first things that comes to mind when thinking of pirates is the hunt for treasure. The combination of gold and copper matches the look of the Spanish coins beautifully, and it certainly dazzles on the nails! Application was a fantastic with a nice dispersal of the flakes and glitters across my nails. Sit back, ye land lubbers! What tales of misadventures this here salty dog can tell ye from sailing the Seven Seas! A warm bright blue base, Salty Dog's Sea Legs is heightened with blue sparks and a light dusting of gold shimmer. I love my blues bold and bright, and I could stare at this polish for hours! The blue sparks combined with the gold shimmer add a gorgeous depth that really makes you feel like you are staring into the ocean! The formula was outstanding, and Salty Dog's Sea Legs applied smoothly with two coats for opacity. Yo ho ho, either I be three sheets to the wind or that thar be the treasure of Captain Blackbeard! What else could have a charcoal black base with golden shimmers and larger gold flakes? I love this type of black polish! Black can sometimes seem a little too harsh, and the added gold gives the final appear of a very dark bronze shade. A particularly adore the addition of the larger gold flakes as they add a nice subtle flash as you move your fingers. Application was perfect with the flakes spreading nicely across my nails. That thar wench be a buxom beauty! I wager her dress me on me hook by night's end! A blackened royal purple base perfectly accessorized with green to gold colour-changing microflakes and green shimmers. Now this is my kind of purple! Brighter colours are lovely, but I tend to prefer a darker version for myself. Wench's Wardrobe is so perfectly dark for the upcoming fall season. I certainly foresee myself wearing this a lot, especially with Halloween quickly approaching! The formula is unbeatable and reached opacity with two immaculate coats. Batten down the hatches and brace for a sell out! Shimmer Me Timbers will make you shiver your timbers with it's oceanic green base, pink to blue colour-changing microflakes, purple shimmers, and a dusting of gold shimmer. 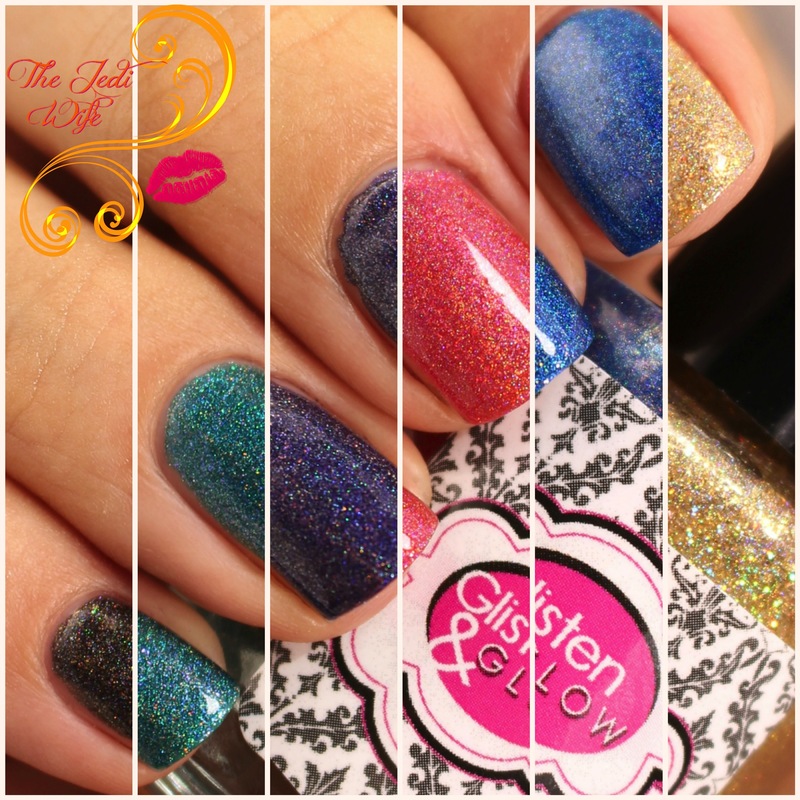 I suspect Shimmer Me Timbers to be the most popular shade from this collection. I am hesitant to describe it as teal since some consider teal to be more green while others more blue, so oceanic green works best here. However you choose to describe it, this polish is breathtaking and the assortment of colours awe-inspiring. The formula was on point with flawless application. The Pirate's Booty Collection launches on the Glisten & Glow website located here this Friday, August 26th at 9pm EST. I could not pick a favorite no matter how had I tried- these are all marvelous, and Jill really did us pirates proud! Until next time, dear readers, may your anchor be tight, your cork be loose, your rum be spiced, and your compass be true! What a fun collection!! The pirate theme is great, and all of the polishes are really pretty! I really like Blackbeard's Booty because it's not a true black (which often seems too teenage goth to me) and Aye Spy Doubloons is just stunning! I love your pictures with the treasure chest! I really should pick up a few of these. 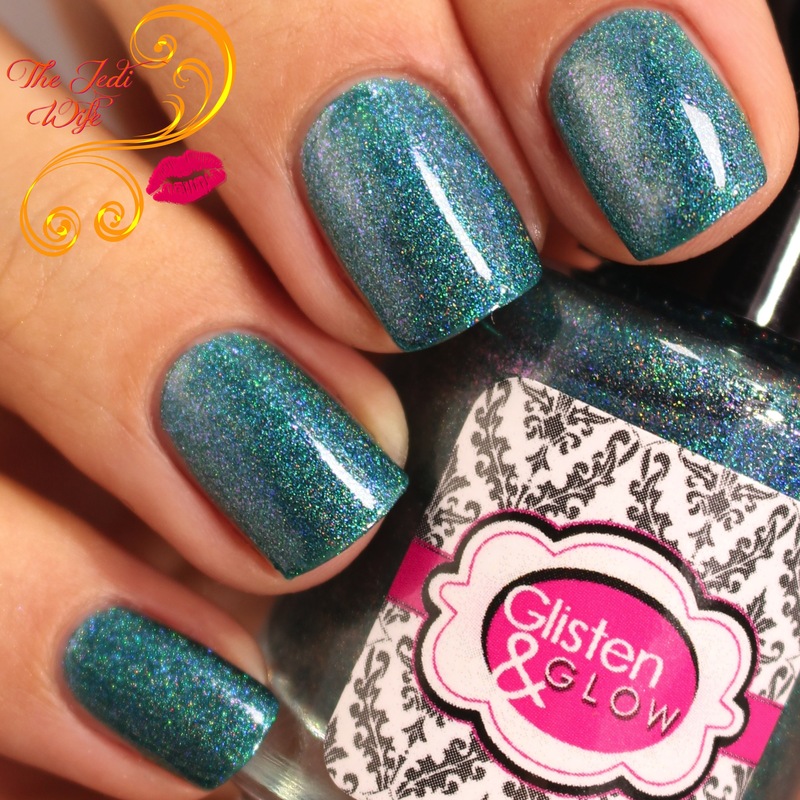 I've been eyeing Glisten & Glow holos for as long as I can remember and still have never bought any. 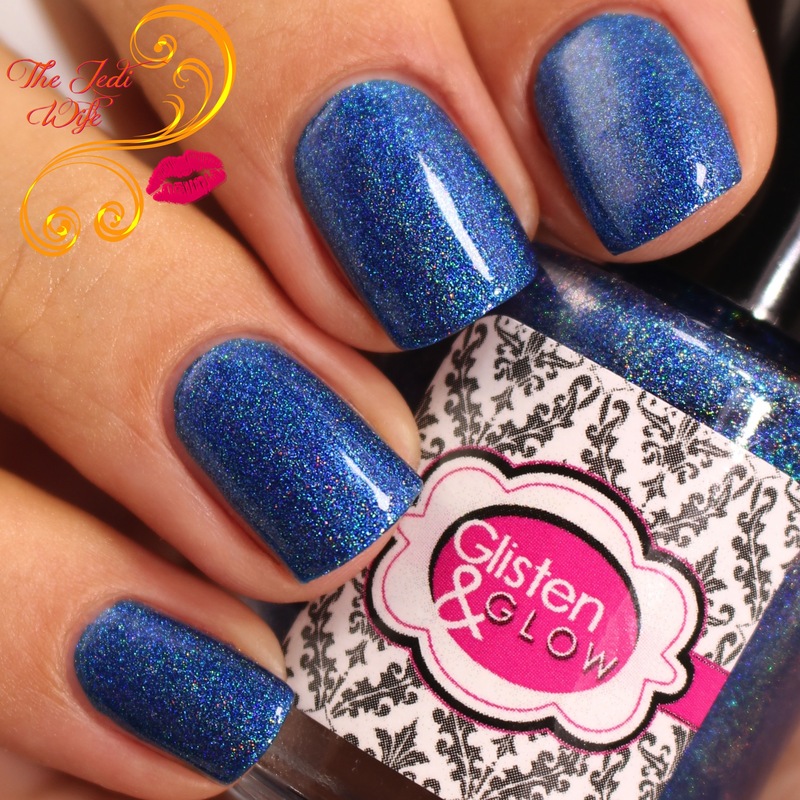 Another hit for Glisten & Glow! I will be picking these up. I only have one Glisten & Glow and wouldn't mind getting this collection. That is a great collection. Lovely colours and an interesting theme too. Aye Spy is great!! I love your swatches! Love your swatches and the prop photo is so adorable! These are seriously all so amazing!